Which is a pretty darn good constant to have in my diet. 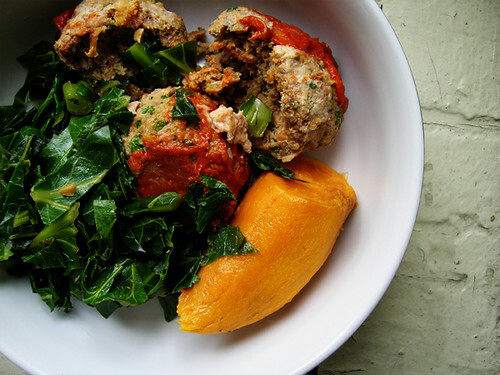 Maybe new variations will pop in, like I've added—or really, recategorized—turkey meatballs this fall, and boy turkey meatballs are delish with greens and sweet potato. ETA: As it happens, I have a cold and this has been my most successful cold yet in terms of getting pretty chop chop through denial, anger, bargaining, and depression, and practicing acceptance, i.e., staying home from Monday practice and my Tuesday client and when I wasn't back to sorts after two days, which no known science would have led me to expect, also my Wednesday client. But anyway, the point. Is three dinners in a row at home, I'm like this is what I eat?? Almost every day??? I mention this as a pretty good example of your mileage may vary. Even I only love spacefood for how it functions in my life when I have thirty minutes to get something down that's delicious and nutritious relative to whatever I'm rushing off to do that evening, and if I had the whole evening ahead at home, and indeed a string of evenings at home, I'd be auditioning a lot more dinners.